100% natural. A safe alternative to Deet - no toxic chemicals. Tropical strength. Suitable for all destinations. Meets all UK safety and efficacy standards. Works for up to 5 hours. Pleasant fragrance and non-greasy. Ethical company - good shopping guide. 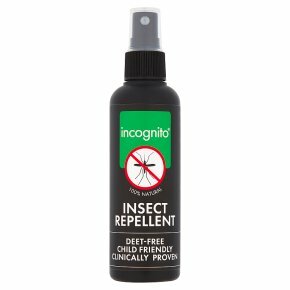 Suitable for vegans.Incognito®provides protection against mosquitoes, midges, sandflies, horseflies, ticks and many more. Suitable for all the family, including babies from 3 months. Our active ingredient Citrepel 75®(PMD), is clinically proven to protect against malaria when used in conjunction with an impregnated mosquito net. Highly effective as it camouflages you from all insects. Directions: Shake bottle, hold 6 inches away from skin and/or clothing and spray. Reapply when necessary.